Thanks to everyone who came to Patriots in Chester for our August phlocking. Jimmy Gladden had everyone on their feet! We collected items for a family who needed help with school supplies and made a 50.00 donation for an AIDS walk members of the PHC of NC are participating in. 1) Which three Sandlappers are siblings? 2) Which Sandlapper is a Tennis instructor? 3) Which Sandlapper has daughter’s named Courtney and Sarah? The following Sandlappers have birthdays in September! Growing Older but, not up! Happy Birthday to all! If you know of someone who has a birthday in September, and is not on the list, please let Mary know. August 29th 2005 is a day most of us will never forget. Over one million Americans and numerous Parrothead families were left homeless. 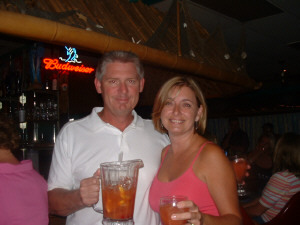 Parrotheads In Paradise along with The Parrothead Charitable Foundation have created a foundation to help Parrotheads in need. 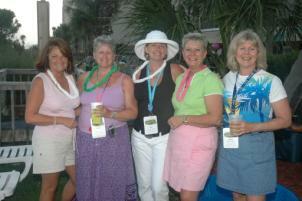 The PHIN foundation is a foundation to which Parrotheads can donate to help fellow Parrotheads. 100% of donations will go to those in need. For more information see www.phip.com there is a link to the PHIN foundation there. Jimmy Gladden and The Rock-a-fellas will provide entertainment for the party on October 15th at the Field Trial Barn in Fort Mill. On the menu…Oysters, grilled Chicken and Oyster shooters. This is a costume party but, costumes are optional...clothing not!. There will be a prize for the winner! Monies raised from the oyster shooters will support the PHIN foundation. The party starts at 7:30 when Jimmy Gladden takes the stage. Admission $10.00. I believe I speak for everyone, who attended the party at Lake Wateree, when I say we had a great time! Roger and Jennifer were wonderful hosts and made us all feel very welcome. The food was great…Cheryl, Jennifer and Jim out did themselves! The lake felt great and the music Jon Durham provided was wonderful! Our small community of tents and campers was not lacking in food, beverage or music that’s for certain! Thanks to everyone who worked so hard to make this happen…Rodger, Jennifer, Rhonda, Brian, DeWayne and Rosie ..Thank you! Adopt-A- Highway…September 17th. Meet at Knight’s Castle at 10:30… social immediately following. Cancer Fundraiser…September25th T-bones at Lake Wylie…stay tuned for details. The Rum Punch Bandits and others will be performing. Endless Carnival/Halloween Party… October 15th at The Field Trial Barn in Fort Mill. Songwriter and resided in the New Orleans area. When Hurricane Katrina hit his city he lost his job at Margaritaville and was displaced from his home. We pitched in together, found gigs for him, hosted a benefit and provided a place for him to stay while in our area. Thanks to BobRob, Ron and everyone else who helped in this effort. If you haven’t seen a Joe Bennett show, you are really missing out. He will be in our area for a while and we will keep you posted on his gigs.